Upgrade Plate 25t - Full Mounting Assemblies. 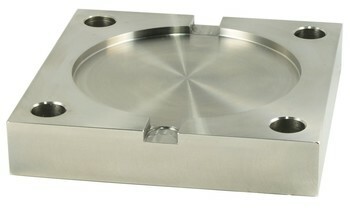 The M-70MUP-25 is a stainless steel upgrade plate that allows a new PT7000 (IP68) stainless steel 25000kg capacity to fit into an existing LPX 25000kg mounting. An existing standard LPX installation is non stainless and generally less than IP68 protected, this is now easily upgraded by the simple replacement of the load cell and the upgrade plate which fits the same footprint as the old mount.